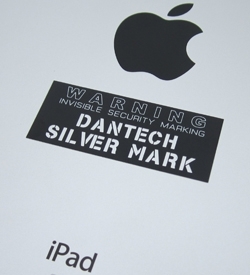 Silver Mark security labels are UV stencils which can be applied to your valuable equipment to give a clear identification of who the item belongs to. Each security label stencil can include your name and other key details, like sequential numbering for easier item tracking. The labels are precision cut by laser and then painted with UV ink to provide permanent ID marking. Silver Mark security labels are made from a special material which CANNOT be removed in one piece and it will break into small pieces if removal is attempted. Even if the id label is forcibly removed the text will still glow visible if viewed under a UV lamp, as used by the police, to identify your property. Security UV stencils suitable for most equipment. - where chemical etching won't penetrate. Prices quoted are ex-factory and exclude VAT & Carriage.